Now a day, neither, corporation, corporation, government, education institutions, finance developed nor other industries need to frequently stay connected. One way to do it is through VCon-HD Server webinar service which helps business present online sales presentations, government officials’ debate, and discussion or negotiate over important issues, education department and training institutions deliver high quality training, and even it can enhance international online collaboration and cooperation between countries, department, associations, organizations and industries. The main advantage of webinar service is that, people don’t need to spend extra time to travel from one place to another. Instead, all kinds of conferences can be hold online. This can, in one way, save a lot time and time to improve work efficiency and productivity, in another way can foster good sense of team spirit and harmonious collaboration. As one of the industry leading web conferencing solutions, webinar software can ensure you a secure, reliable, scalable and customizable online webinar with up to 720P and 1080P high definition video quality. With rich features provided, it can definitely satisfy you diverse requirements. One of the most distinctive features of our webinar software is that it supports up to 56 video streams to be displayed simultaneously. If there are more than 16 attendees need to be involved, set each video stream broadcaster by turn. Effectively and efficiently enhance global collaboration with multiple video presentation tools such as exchange of text message, file sharing, media sharing, screen sharing, desktop sharing, whiteboard, electronic voting, remote control etc. According to your own requirements you can choose to record your desired parts of webinar with either SD video recording or HD video recording (up to 1080P) using the advanced H.264 MP4 video encoding technology with webinar software. 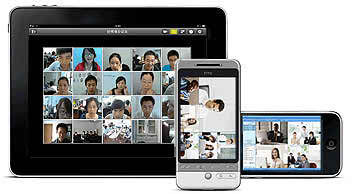 Vcon-HD webinar service is fully compatible with Android OS based devices and iOS devices like iPhone, iPad. Therefore, you can not only have your online webinar on your computer, laptop, but also on mobile device instantly no matter where are you. In order to communicate and discuss more conveniently. You can use Breakout Rooms to split the main webinar event into several small webinar events. 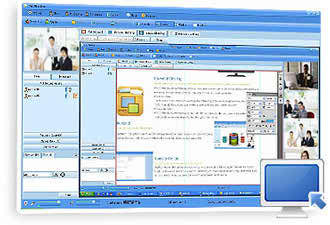 Breakout webinar events have the same features as that of the main webinar event.